After Old Turtle swims his last swim and breathes his last breath, and the waves gently take him away, his friends lovingly remember how he impacted each and every one of them. As the sea animals think back on how much better Old Turtle made their lives and their world, they realize that he is not truly gone, because his memory and legacy will last forever. 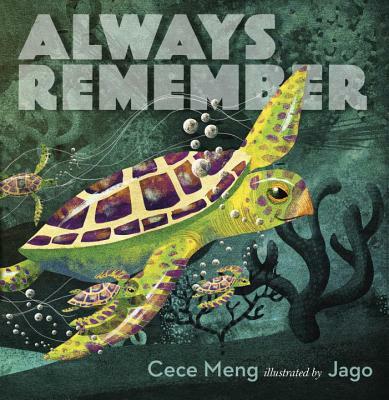 Jago's gorgeous illustrations accompany Cece Meng's serene text in a book that will help chidren understand and cope with the death of a loved one. Cece Meng (www.cecemengbooks.com) is the author of Bedtime is Canceled, I Will Not Read This Book, The Wonderful Thing About Hiccups and Tough Chicks. She lives with her family in Santa Cruz, California. You can follow her on Twitter at @iwrite4kids. Jago (www.jagoillustration.com) is the award-winning illustrator of Thoughts to Make Your Heart Sing, among many others. He lives with his wife and children in Cornwall, United Kingdom. You can follow him on Twitter at @jago.